22nd Annual FSB Golf Classic Was a Success! Thank you to the 81 participants, 94 hole sponsors, and donors for helping raise $21,000 for area Catholic schools. Sacred Heart School in Freeport, St. Mary’s School in Melrose, and St. John’s-St. Andrew’s School in Greenwald will each receive $7,000. Thank you for your continued support. We hope to see you next year! Polka Mass at 7:30 PM with music to follow. 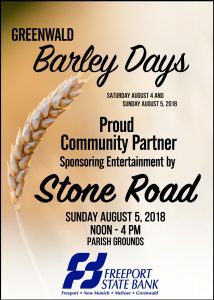 Enjoy the music of Stone Road on the parish grounds from noon to 4pm. Sponsored by Freeport State Bank. Come and support area Catholic Schools at the 22nd Annual Freeport State Bank Golf Classic Thursday July 19, 2018 at Meadowlark Country Club in Melrose. 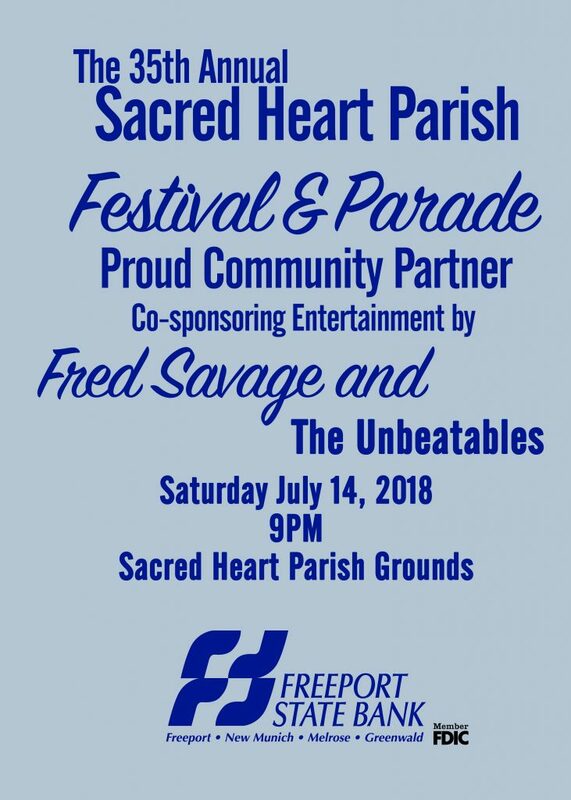 Enjoy the music of Fred Savage and the Unbeatables on the parish grounds. Co-sponsored by Freeport State Bank. Festivities kick off with the parade at 10:30 am and continue throughout the day. Jim Ploof will be doing caricature drawings from 1pm-4pm in the Melrose Branch lobby. 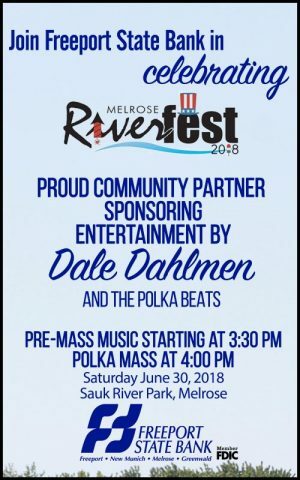 Enjoy the music of Dale Dahlmen and the Polka Beats! Pre-Mass Music starts at 3:30 pm and Polka Mass begins at 4 pm Sauk RiverPark. Be sure to bring a lawn chair. Please join Freeport State Bank in celebrating the 41st Annual MunichFest. We are a proud community partner sponsoring entertainment by Contention on Saturday June 16, 2018 from 9pm-1am at the Immaculate Conception parish grounds, in New Munich. June is dairy month! Join us each Friday to celebrate. June 22nd – Build a sundae at Freeport and Melrose. Are you struggling with how to organize and use financial records; develop and analyze financial statements; and make informed decisions regarding finances and production? Contact our AG Consultant Mark Stenson at (320) 987-2265 or Joe Fuechtmann, Commercial Credit Analyst (320) 256-7208 for help. Freeport State Bank Celebrates 110 Years! Customer service is our priority. Freeport State Bank is proud to be your hometown bank since 1908. © 2019 Freeport State Bank | All rights reserved.